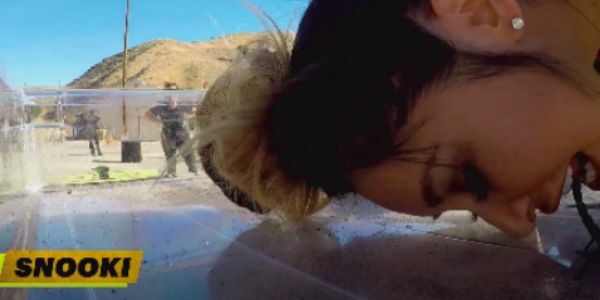 Fear Factor is back — this time with celebrities... and whole lot of animal abuse. The revival, premiering July 17 on MTV, will be hosted by Ludacris and feature celebrities like Tyga, Bam Margera and Snooki pitted against one another, performing dangerous and disgusting stunts to win the prize. Unfortunately, by the looks of teaser videos, the new Fear Factor is going to feature a lot of animal abuse. That's why we're calling on MTV to cancel the show. MTV recently shared a promo video for the show on the network's Instagram page. In the episode, contestants stand before a line of cages holding various animals. There's a skunk, a snake, a pig, a tarantula, and more. After decoding an emoji code, contestants race to move animals from one cage to another across the playing field. The animals look terrified as they frantically try to escape the contestants trying to corral them. In another promo, contestants are shown sucking on scorpions and carrying crabs in their teeth as they move them around. Using animals in entertainment is always a bad idea, but purposefully abusing animals for entertainment is just sick. Surely there are plenty of ways to shock viewers that don't involve animal cruelty. Animal abuse isn't cool or funny. Please sign this petition urging MTV cancel Fear Factor until it can produce a season without torturing innocent animals.